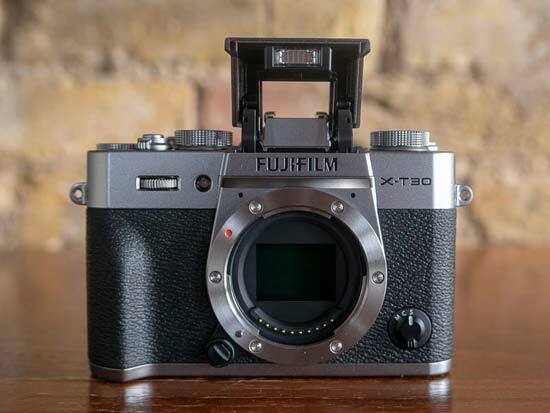 The Fujifilm X-T30 is a new mid-range mirrorless camera that's smaller, lighter and a lot cheaper than the flagship X-T3 model, yet in some ways is actually slightly more advanced than the X-T3. The X-T30 features the same 26 megapixel X-Trans BSI CMOS 4 APS-C sensor as the X-T3, DCI 4K video recording at up to 30p in 4:2.2 10-bit via HDMI, 1080p video at 60fps, the latest X-Processor 4 image processing engine, and an extended ISO range of 80-51200. It has a tilting 3-inch touchscreen LCD with 1.04-million-dot resolution, a 2.36-million-dot 0.39-inch OLED electronic viewfinder with 100fps frame rate, 425 AF points with phase detection pixels across the entire frame (100%), the ability to focus down to -3EV, improved Face and Eye AF including a new Face Select function, and 30fps continuous shooting with the electronic shutter or 8fps with the mechanical shutter with continuous AF/AE. The X-T30 also offers a built-in pop-up flash, exposure compensation up to ±5 stops, wi-fi and Bluetooth connectivity, USB charging, 380-shot battery life, interval timer shooting, in-camera raw conversion, a range of film simulation modes, multiple exposure and panoramic shooting modes, Digital Split Image and Focus Peaking for easier manual focusing, an ultra-fast electronic shutter that is capable of exposures up to 1/32000sec, a new Focus Lever, a dedicated Auto Mode Switch Lever and a traditional threaded cable release. 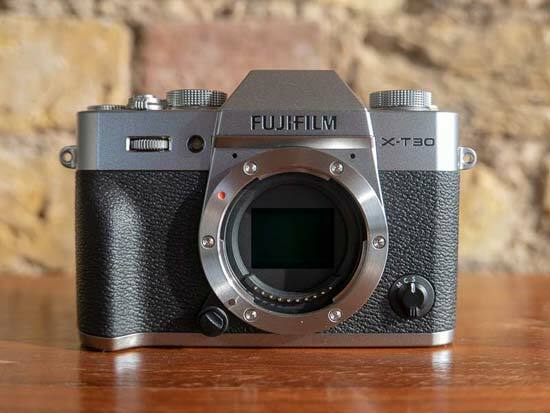 The Fujifilm X-T30 is available in three different colours - Black or Silver from the 20th March 2019, and the new Charcoal Silver colour in May 2019. It's priced at £849 / $899 body only, £899 / $999 with the XC 14-45mm lens, or £1199 / $1299 with the XF 18-55mm lens. 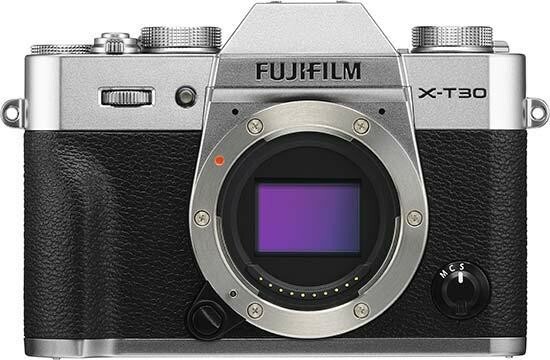 The new Fujifilm X-T30 looks outwardly very similar to the 2-year-old X-T20 model that it replaces, with the main change being the addition of a Focus Lever in place of the X-T20's D-pad. Other more subtle changes include a new grip design on the front and the relocation of the Q.menu button, which has been embedded into the top of the rear thumb-grip. Otherwise, you'd be hard pressed to tell the two cameras apart when placed side-by-side. The X-T30 is smaller and lighter and than the flagship X-T3 camera, weighing in at 333g body only and 383g with the battery and memory card fitted, and measuring 118.4mm (W) x 82.8mm (H) x 46.8mm (D). One of the key physical differences between the X-T3 and X-T30 is that the latter is not weather-proof, in keeping with its mid-range status, but something that's important to note if you're trying to decide between the two. Another difference is the X-T30's higher-resolution electronic viewfinder, which has 3.69m dot resolution compared with 2.36m dots on the X-T30, while the magnification is only 0.62x rather than 0.75x on the X-T3. At the heart of the X-T30 is the same 26.1 megapixel APS-C sized “X-Trans IV” CMOS sensor as used by the X-T3 and the same X-Processor 4 image processing engine, so the X-T30 delivers exactly the same still image quality as Fujifilm's flagship camera, at a much more affordable price-point. The new extended ISO range of 80-51200 makes the X-T30 well suited to low-light shooting, especially as it can now focus down to -3EV, allowing you to hand-hold the camera in places where you'd usually be reaching for a tripod. The clever ISO Auto Control setting allows you to set a maximum sensitivity (up to 6400) and a minimum shutter speed (1/30th is a good starting point), with the camera over-riding your ISO choice if it thinks you're being too ambitious whilst maintaining a shutter speed that won't introduce camera shake. The X-T30 can record DCI 4K video (4096x2160 pixels) at frame rates of 29.97p/25p/24p/23.98p at 200Mbps/100Mbps quality for up to 4Gb of footage, using a full 6K (6240x3510pixel) read-out with no cropping. If you don't need 4K, then full 1080p recording is also available at 60p / 50p / 30p / 25p / 24p. There is a HDMI port for connecting the X-T30 to a high-definition TV or external recorder, and you can adjust the level of the internal microphone and attach an external mic for better sound quality via the shared Mic/Remote port. 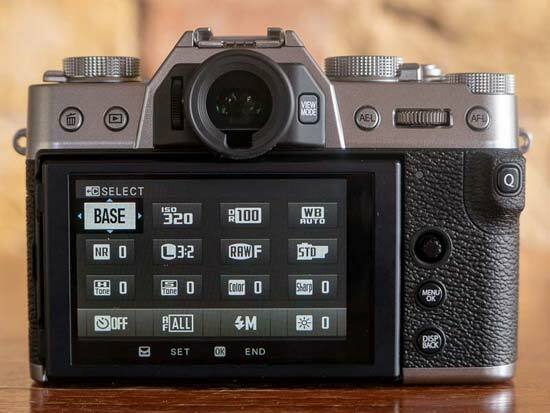 Despite the increased emphasis on video recording, the X-T30 still doesn't have a one-touch Movie Record button, which is instead assigned to the drive mode dial. The X-T30 now features both built-in wi-fi and Bluetooth connectivity. The latter option creates a constant, low-power connection between the X-T30 and a smartphone/tablet to transfer images and video using the Fujifilm Camera Remote smartphone app, while the former allows you to remotely control the X-T30 via a 2.4Ghz wi-fi connection using a smartphone or tablet and the Fujifilm app, and transfer images and video from one device to the other. The X-T30 has a slightly larger, more sculpted hand-grip at the front than on the X-T20, although as this quite a small camera, you can still only fit three fingers on it, with your little finger naturally curling underneath the bottom of the body. There's also a prominent grip on the rear of the camera for your right thumb that again is larger than the one on the X-T20, although this size increase has been made mainly to accommodate the repositioned Q.menu button. We're not huge fans of the new position of the Q button, which proved to be overly sensitive and prone to being inadvertently pressed. There is a menu option to disable it completely, but we'd actually prefer a way of lengthening the press required to activate it to, say, 1 second, rather than turning it off altogether, as it's such a useful feature. A textured faux-leather surface runs around the full width of the camera, with two small metal eyelets on either side of the body used for connecting the supplied shoulder strap. A metal tripod mount is positioned slightly off-centre from the lens and next to the battery/memory card compartment, so you'll have to remove the camera from the tripod to change the battery or the memory card. The X-T30 still only offers compatibility with Ultra High Speed UHS-I SDXC memory cards, whereas the X-T3 is also compatible with faster UHS-II cards, and the latter also has two card slots rather than one. Despite this, the X-T30 inherits the same 30fps fast continuous shooting rate that the X-T3 also offers, with full AF/AE metering and completely blackout free between frames, achieved by using the electronic shutter and maintaining the live view at 60fps. The main caveat of the 30fps mode is that the camera automatically enters the Sports Viewfinder Mode and applies a 1.25x crop factor, dropping the resolution from 26 down to 16.6 megapixels, although there's also a benefit in that you can still see outside the cropped area, allowing you to predict where the subject is moving into the frame. If you do want the full 26 megapixel resolution, the X-T30 can shoot at a "slower" 20fps without any cropping, or 8fps using its mechanical shutter, both again with full AF/AE metering. To help with capturing the precise moment, the X-T30 also has the same clever Pre-shot burst shooting mode as the X-T3, with the camera constantly filling the buffer while your half-press the shutter button, and then keeping the most recent ones taken 0.5-1 seconds before a full press of the shutter button, eliminating any camera and human-added delay. Note that this feature only works with the electronic shutter. The main difference between the X-T30 and X-T3 in terms of burst shooting is the buffer size. The number of recordable images in a single burst is much lower than on the X-T3, as the buffer is about half the size on the X-T30 - it can only record 26 JPEGs / 17 RAWs for the 30fps mode, 32 JPEGs / 17 RAWs for the 20fps mode, 81 JPEGs / 18 RAWs for the 10fps mode, and 90 JPEGs / 18 RAWs for the 8fps mode in a single burst. As already mentioned, the X-T30 actually has two kinds of shutter, mechanical and electronic. When using its mechanical focal-plane shutter, the X-T30 has a top shutter-speed limit of 1/4000th second in all shooting modes. There's no built-in ND filter, so if you want to use a very fast lens in very bright sunlight, then it's a good idea to buy an actual glass ND filter. The X-T30 also has the same flash-sync speed of 1/180th second as the previous X-T20. The X-T30 also has a completely silent electronic shutter which provides a much faster top shutter speed of 1/32,000th second. This allows you to continue shooting wide-open with fast aperture lenses in the brightest of conditions without having to resort to fitting a glass ND filter or using an external flash and lights. There are some important caveats with the electronic shutter though - the ISO range is restricted to 200-6400, you can't use the pop-up flash, and the slowest possible shutter speed is only 1 second. To make the camera even less obtrusive, when the electronic shutter is selected, there's a Silent menu option which turns off the speaker, flash, AF-assist lamp and most importantly the shutter-release sound, instantly making the X-T30 perfectly suited to more candid photography. 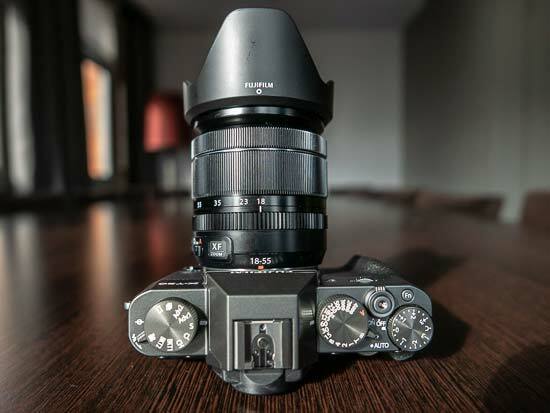 The X-T20 was no slouch when it came to auto-focusing, but Fujifilm have made the X-T30's AF system even better, so much so that at the time of writing it even out-performs the X-T3! There are now 425 AF points in total and 2.16M PDAF pixels, up from 0.5M on the X-T20, and the X-T30 can also focus down to -3EV when used with particular (but not all) lenses, which is a significant improvement on the X-T20. The X-T30 is also one of the few cameras on the market to offer 100% coverage of the phase detection AF area, allowing you literally focus anywhere that you want. The X-T30 additionally offers improved Face Detection AF during both movie recording and stills, and it also detects obstacles better without having to manually move the AF box. The Eye AF tracking feature has a new, easier to understand GUI, whilst the new Face Select function allows you to use either the touchscreen or the new focus lever to quickly switch between faces in the frame. Fujifilm also claim that the X-T30's AF system offers 300% faster autofocusing on a subject moving from from far to near or near to far. All of these improvements will also reach the X-T3 via an upcoming firmware update. The Fujifilm X-T30 uses exactly the same sized viewfinder as the previous X-T20, a 0.39-inch OLED unit with 2.36-million-dots and a display time lag of just 0.005 seconds, but it's now brighter and has a faster 100fps frame rate. The 3-inch touchscreen display on the rear is also mostly the same as the one on the X-T20. It offers 1.04-million-dot resolution and can be tilted up and down, making it ideal for shooting from more unusual angles, but not so suitable for vlogging. It is ever so slightly thinner, by 1.3mm, and offers improved touchscreen response. You can use it to set the AF point, or even fire the shutter release. On the right hand side of the screen you’ll see a small icon which if you press it allows you to choose between using the screen to set the AF point, or to have it focus and then take a picture. If you prefer, you can turn off the touchscreen functionality altogether. On top of the X-T30 is a control dial for setting the shutter speed, with settings ranging from 1 second to 1/4000th second, an Auto option, a T setting for longer exposures (2 to 30 seconds, set via the circular command wheel) and a Bulb mode for exposures up to a whopping 60 minutes in length. Surrounding the XF 18-55m kit lens is a very traditional and very welcome aperture ring, although it has no markings due to the variable aperture. This dial also allows you to choose third-stop apertures. 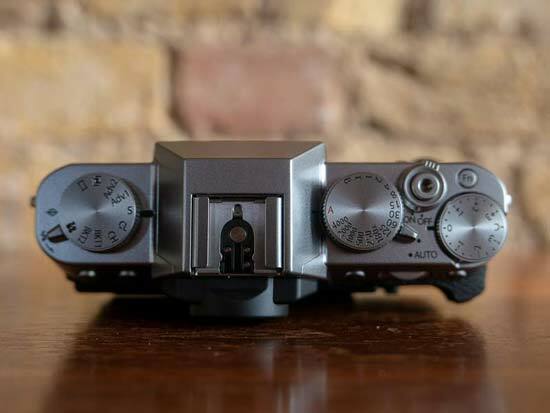 You can also choose to use the front and rear control dials to set the shutter speed and aperture if you prefer a more DSLR-like way of working. Alongside the shutter speed dial is another dial for changing the exposure compensation, with a range of +-3EV and a Custom setting, and on the left-hand side is a third dial for moving between the bracketing, burst, multiple exposure, advanced and panorama functions, with a switch underneath for releasing the pop-up flash. One key difference to the X-T3 is the lack of a dedicated ISO speed dial, perhaps understandable given the X-T30's reduced size and different target audience, but still annoying for more experienced users. Instead, you need to dive into the menu system to set the ISO. There's also no dedicated dial for setting the metering mode. There's a small lever on top of the X-T30 for turning on the dedicated Auto Mode. In this Advanced SR AUTO mode, the X-T30 automatically selects the optimum shooting settings from 58 preset scenes, including the best AF mode. More confident beginners can then use the rear Command Dial to select a specific scene type. While this new switch makes it easy to enter full Auto mode, we did find ourselves accidentally turning it on quite a lot, as the switch is very similar to the On/Off switch and also positioned very near to it. 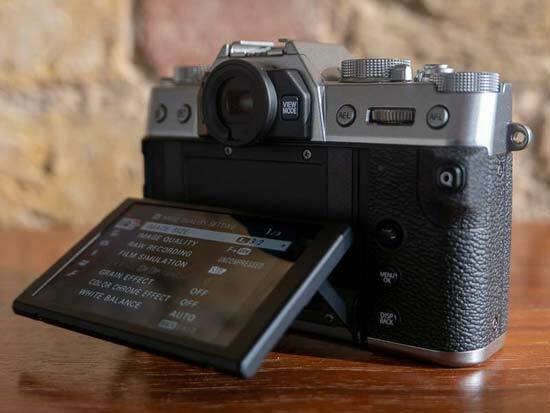 Four other controls complete the X-T30's top-plate. The small but responsive shutter release button is encircled by the On/Off switch, and there's a thread for a traditional mechanical cable release. Alongside is the rather tiny Fn button, which by default provides quick access to the Wi-Fi options, but can be customised to suit your own needs from 12 different settings. Further customisation is available via the 7 Custom Menu options, which let you create, save and recall up to 7 sets of user-defined settings, and no less than 7 configurable function buttons. Finally there's an external flash hotshoe for suitable dedicated external units, along with the built-in flash which has a guide number of 5. 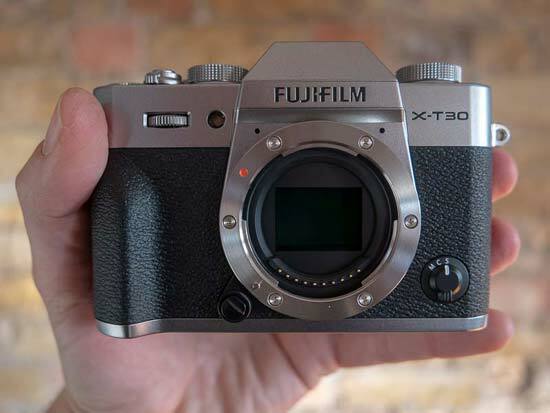 The X-T30 has the same logical rear control layout as the X-T20, with one main design change. Above the LCD screen and to the left of the viewfinder are two buttons for image deletion and image playback, while on the right is the AE-L button, rear control dial and the AF-L button. Beneath those is the Quick Menu button, now set into the rear thumb grip. This provides quick access to lots of frequently used shooting settings including the ISO speed, White Balance, File Size and File Quality. Underneath is the new 8-direction Focus Lever, which replaces the X-T20's more traditional 4-way controller. It's exactly the same size and works in exactly the same way as the one on the X-T3, although crucially it is positioned a little too low down the body, making it more awkward to find in a hurry. Other than the positioning, the Focus Lever is a very welcome change, even though it comes at the expense of the navigation pad. Underneath the Focus Lever is the Menu button, which accesses the eight Shooting and Set-up menus, and finally the Disp/Back button which is used for changing the LCD display or going back. The X-T30 uses exactly the same NP-W126S Li-ion battery as the previous X-T20 model, providing a CIPA rated life of 380 shots. 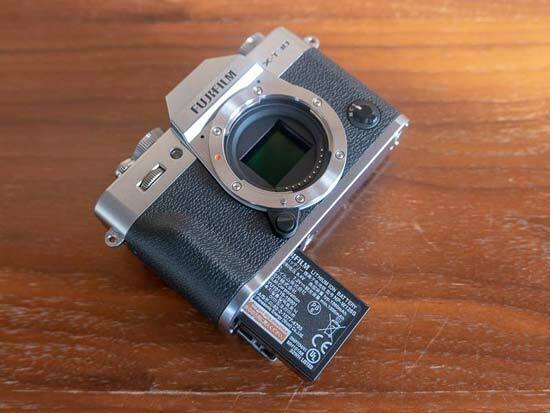 You can also now recharge the camera via its USB Type-C port, though, as well as using the supplied charger, so that you can charge it from an external power-bank out in the field.